Our pawnshop is a great place to get electronics. Being as the technology changes so fast, you wouldn’t want to pay retail for a digital camera or a laptop! We have great electronics from iPods to LCD and Plasma T.V.’s. Is there a birthday or christmas coming up soon? Does your kid or husband want something you just can’t find? 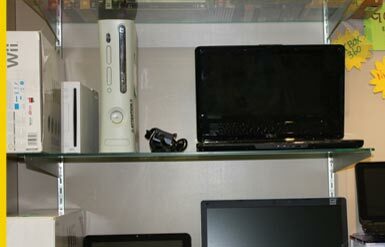 Give us a call, we always have a wide selection of computers, laptops, cameras, Ipods, and gaming systems. Since we only accept current electronics we may just have what you are looking for at a fraction of retail. We will give cash for iPod touches, LCD and Plasma T.V.’s, digital cameras and camcorders, gaming systems, and laptops, both pc and mac. Please call us with any questions regarding your electronics.